Not much of a prison. All Ness has to do is hit that POW block three times and she’s free. AND.. What happened to Nicole and Riley?? I love how Nessy is sitting on a POW Block, and Nessy herself is a Prisoner Of War (POW). Oh my, Rick’s tail is prehensile! That POW block made me laugh. Great to see them having fun like this. Okay; someone want to explain a “POW block” to me?? - Does it represent a block of explosive? - Or, does it actually mean “Prisoner Of War” and that’s just the base at which the prisoner is supposed to stay until rescued? - ORRrrr.. Something else entirely?? What it does is that when it’***** / dropped, every enemy on the ground gets hurt / flipped over. So, in summary. It’s just a pun. 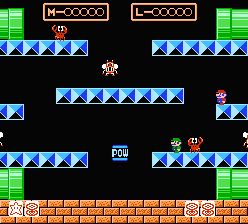 Fun fact: there’s actually a game for the NES called POW: Prisioners of War. It’s pretty mediocre. finally got caught up. I wish more adults would do stuff like this. All the adults round here are to mature and boring. They ignore anything fun and interesting and just sit around mopeing and groaning about problems they don’t want t try to fix. Why i talk to peoples pets instead of people. They are far more fun to talk to and actually understand what i am talking about. You talk to an adult about something that they used all the time as a kid and they don’t seem to have a clue what your talking about.